Dwight Lyman Moody (February 5, 1837 - December 22, 1899), also known as D.L. Moody, was an American preacher, evangelist and publisher who founded the Moody Church, the Mount Hermon School in Massachusetts (now the Northfield Mount Hermon School), the Moody Bible Institute and Moody Publishers. He was the preeminent figure at the center of the Third Great Awakening. His sermons were known to be colloquial, simple, and full of conviction. Along the path of his great revival tours, he worked with men such as Henry Drummond, whom he eagerly defended against orthodox attack, George Adam Smith, and Charles Spurgeon. Moody's sermons were sold widely in English, and in German, Danish, and Swedish versions. Moody was a driving force in the success of the YMCA movement and did much to spread the Christian message in the United States, Great Britain, and throughout the world. He inspired great future evangelists like Billy Sunday, and his Moody Bible Institute remains an important center of learning in the Evangelical tradition. Dwight Moody was born in the village of East Northfield, Massachusetts to a large family. His father, Edwin Moody, a small farmer and stone mason, died at the age of 41 when Dwight was only four years old. At that time, he had five older brothers and a younger sister, with an additional twin brother and sister born one month after his father's death. His mother, Betsy (nee Holton) worked hard to maintain her family, sending some of the children off to work at other local farms at times, including Dwight. Amid all the challenges of raising a large family alone, she continued to send her children to church. Together with his eight siblings Dwight was raised in the Unitarian Church. When Moody turned 16, he moved to Boston to work in his uncle's shoe store. One of his uncle's requirements was that Moody attend the Congregational Church of Mount Vernon where Dr. Edward Norris Kirk was pastor. It was at this time, in April 1855, that Dwight Moody converted to evangelical Christianity. He moved to Chicago, Illinois in September, 1856, working as a traveling shoe salesman. In Chicago, he soon joined the Plymouth Congregational Church and began to take an active part in its prayer meetings. In the spring of 1857, he began to minister to the welfare of the sailors in Chicago's port as well as gamblers and thieves in the saloons. Along with businessmen J. B. Stillson and John Farwell, he traveled far and wide, teaching in hundreds of Sunday schools in the greater Chicago area. As a result of their efforts, within a year the average attendance at Moody's own school was 650, with 60 volunteers from various churches serving as teachers. It became so well known that the just-elected President Lincoln, on his way from Springfield, Illinois to Washington, D.C., visited and spoke at one of these Sunday school meetings on November 25, 1860. On August 28, 1862, Dwight L. Moody married Miss Emma C. Revell, with whom he would later have a daughter Emma Reynolds, and two sons, William Revell and Paul Dwight. Emma Revell had for some years been a helper in his mission in North Chicago. After the Civil War began, Moody was involved with the United States Christian Commission of the YMCA and paid nine visits to the battle-front, being present among the Union soldiers after the conflicts of Shiloh, Pittsburgh Landing, and Murfreesboro. He ultimately entered Richmond with the army of General Grant. At around the same time, his growing Sunday school congregation needed a permanent home, so Moody started a church in Chicago, the Illinois Street Church (the forerunner of today's Moody Church). In June 1871, Moody met Ira D. Sankey, former Internal Revenue Service agent, then famed Gospel singer, with whom he soon partnered. In October of 1871, Sankey and Moody were in the middle of a revival meeting when the Great Chicago Fire broke out. The two men, along with those assembled, barely escaped the conflagration. However, the fire destroyed Moody's church, home, the YMCA, and the dwellings of most of his members. Within a few weeks he and his members sprang into action and rebuilt a new building, the Northside Tabernacle, turning it into a relief center that helped feed and clothe the thousands who had lost their homes in the fire. His church was rebuilt within three months at a nearby location and renamed as the Chicago Avenue Church. A few years later, in 1875, Moody and Sankey would develop a hymnbook, Sacred Songs and Solos (later called Gospel Hymns and Songs), which grew out of solos that Sankey and the congregation performed prior to each of Moody’s messages. Eventually, the book sold more than eight million copies and raised a reported $35,000 for the permanent church structure. In the years after the Great Chicago Fire, Moody's wealthy Chicago supporter, John Farwell, attempted to persuade him to make his permanent home in Chicago, offering to build Moody and his family a new house. But the now-famous Moody—also sought by supporters in New York, Philadelphia and elsewhere—chose the tranquil farm he had purchased next door to his birthplace in Northfield, Massachusetts. Northfield would become an important location in evangelical Christian history in the late nineteenth century as Moody would organize summer conferences led and attended by prominent Christian preachers and evangelists from around the world. It was also in Northfield that Moody founded the Northfield Seminary for Young Ladies, which opened in 1879, and the Mount Hermon School for Boys, which would open in 1881. Both later merged into today's Northfield Mount Hermon School. In 1870, four years after opening the church on Illinois Street, Dwight Moody was introduced to Emma Dryer. Emma was a principal and teacher at Illinois State Normal University and was also deeply devoted to teaching the youth of Chicago about Christian doctrine and Scripture. In 1871, Moody began to simultaneously minister to the needs of those damaged financially and physically by the fire, inviting all the youth to his Church. Dryer was invited to teach Bible Study classes. In 1883, Dryer, with the permission of Moody, organized and headed what was known as the "May Institute," a weekly meeting in which church members would meet and pray. From these meetings, came requests that Moody open up a new school leading directly to the birth of the Moody Bible Institute (originally called the Chicago Evangelization Society) in 1886. Moody also greatly believed in the work of cross-cultural and world evangelism. 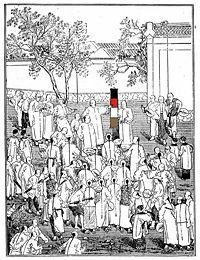 He actively supported the China Inland Mission and encouraged many within his congregation to volunteer for service overseas. He also actively promoted "The Wordless Book," a teaching tool that had been invented by Charles Spurgeon in 1866. This book has been and is still used to teach uncounted thousands of both young and old illiterate people around the globe about the Gospel message (Austin 2007). A trip to England in the spring of 1872 would cement Dwight L. Moody's reputation as a world-renowned evangelist. So great was the "supernatural" power that attended his work there that it was soon called the "Third Great Awakening." 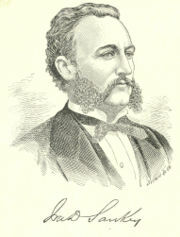 He would preach at almost one hundred revival events over a period of several months. His preaching had an impact as great as that of George Whitefield and John Wesley in Britain, Scotland, and Ireland. A meeting at the Botanic Gardens Palace was reportedly attended by between 15,000 to 30,000 people. On several occasions Moody would fill stadiums of 2,000 to 4,000 capacity. Government leaders, including British Prime Minister Gladstone, complimented and endorsed Moody after some initial distance. Such great turnouts continued throughout 1874 and 1875, with crowds of thousands at all of his meetings. During his visit to Scotland he was helped and encouraged by Andrew A. Bonar. In Scotland he reportedly addressed an estimated 50,000 people outdoors from a buggy. He and Sankey next moved on to Ireland, preaching in Belfast, returning again back to London. There he was promoted and assisted by the famous London Baptist preacher, Charles Spurgeon. Overall, it is estimated that for the three years of the tour, crowds exceeded 2.5 million. Subsequently, Moody, along with Sankey, began to outline a tour for an American revival. When he returned to the United States, crowds of 12,000 to 20,000 became common. In Philadelphia, on January 19, 1876, President Ulysses S. Grant and members of his cabinet sat on the platform with Moody. His revival meetings were held from Boston to New York and throughout New England. Campaigns followed in Chicago, Boston, Cleveland, Cincinnati, Richmond, Denver, Colorado Springs, and St. Louis. In the West, he went to San Francisco and then traveled to many other cities and towns from Vancouver to San Diego. In his theology, Dwight Moody was considered a premillennial revivalist which lays stress on the Gospel with emphasis on the literal return and reign of Christ on the earth. The doctrine is called premillennialism because it views the current age as that (immediately) prior to Christ’s kingdom. It is distinct from other forms of Christian eschatology such as amillennialism or postmillennialism, which view the kingdom of God as either figurative or as occurring prior to the Second Coming. Moody differed particularly from Charles Grandison Finney, a contemporary evangelist and postmillennialist of the era who preached that one day wars would cease and peace would reign on the earth based upon the gradual triumph of good over evil. Dwight Moody preached his last sermon on November 16, 1899 in Kansas City, Kansas. Becoming ill, he returned home by train to Northfield. During the preceding several months, friends had observed that he had added some 30 pounds to his already ample frame. Although his illness was never diagnosed, it has been speculated that he suffered congestive heart failure. He died on December 22, surrounded by family. Already installed by Moody as leader of his Chicago Evangelization Society, R. A. Torrey succeeded Moody as its president. Ten years after his death, the Chicago Avenue Church was renamed The Moody Church in his honor, and the Chicago Evangelization Society was likewise renamed Moody Bible Institute. The Moody Bible Institute in Chicago today. Toward the end of his life, Moody confided in a friend, "My school work will not tell much until the century closes, but when I am gone, I shall leave some grand men and women behind." 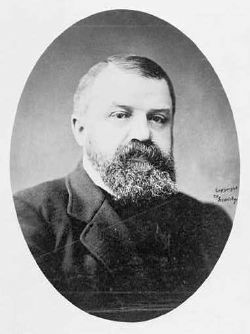 Dwight L. Moody mentored hundreds of pastors and evangelists including Billy Sunday. He was also a major catalyst for the early growth of the YMCA, of which for a time he was a local chapter president. The rise of that movement in Great Britain as well as the parallel organization, the YWCA, owe much to Moody's early support and energy. The Moody Bible Institute and Moody Publishers stand today, as well, as major institutions and resources for worldwide Christian evangelism. "A good example is far better than a good precept." "A man ought to live so that everybody knows he is a Christian... and most of all, his family ought to know." "If I take care of my character, my reputation will take care of me." "We talk about heaven being so far away. It is within speaking distance to those who belong there. Heaven is a prepared place for a prepared people." "Where one man reads the Bible, a hundred read you and me." 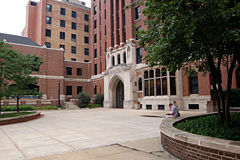 Moody Bible Institute – www.moody.edu. Christian Biography Resources – www.wholesomewords.org. The Life and Work of Dwight Lyman Moody – www.biblebelievers.com/moody. D.L. Moody and 19th-Century Mass Evangelism – enrichmentjournal.ag.org. This page was last modified on 5 October 2017, at 16:11.